The pink-bloomed cascading plants often seen in rock gardens in the spring belong to the phlox family. 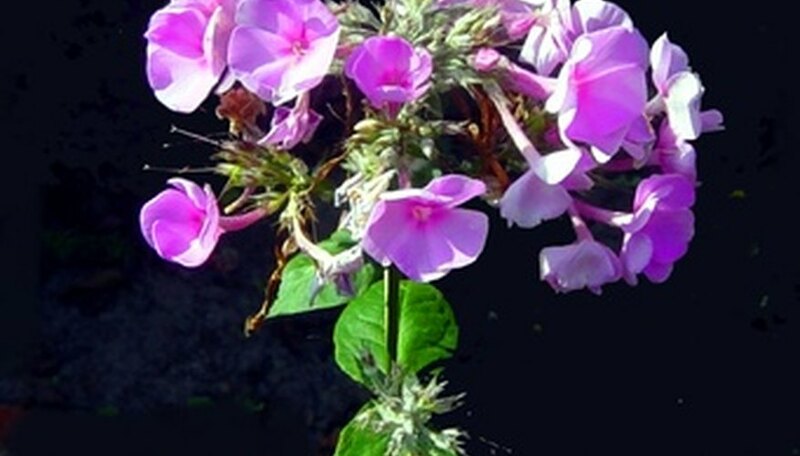 Phlox consists of upright and creeping varieties of this perennial plant. Types of pink phlox include cultivars with a range of pink-hued flowers to suit any gardener's preference. Both upright and creeping varieties provide long-lasting color in the landscape. The low-growing habit of the creeping phlox perfectly suits this plant to rock gardens and edging. Phlox grows in a trailing mound that gently drapes over the edge of retaining walls or nearby rocks. This evergreen perennial reaches heights of up to 6 inches and spreads to a mound about 2 feet in size. Creeping phlox--also called moss pink--produces small, light pink flowers each spring. The creeping varieties of phlox are among the very first bloomers in the spring. Plant in USDA hardiness zones 3 to 9 for best growing results. Give this plant a trimming after blooming to ensure plenty of foliage to provide texture in the landscape. Home fires phlox presents a much deeper pink tone than the creeping phlox color. The bright hue contrasts well with the deep green foliage on this beautiful creeping plant. This type of pink phlox reaches about 6 inches in height and 24 inches in width. Blooms appear in early spring and feature five distinct petals in a deep pink color. Home fires phlox likes well-drained soil and full sun. Excessive wetness will destroy the plant. Plant in USDA hardiness zones 3 to 9 after consultation with the grower information provided at the time of purchase. Some phlox only tolerate planting in zones 4 to 8. Phlox Carolina differs from creeping phlox in the basic growth habit of the plant. This plant reaches heights of up to 3 feet. Phlox Carolina doesn't spread as readily as creeping phlox but will form a bush-like, robust plant after a few growing seasons. Foliage is lance-shaped and alternates along the length of the stem. Each stem is topped by a cluster of flowers ranging in size from 1/2 to 3/4 inch in width. Carolina phlox produces fewer flowers than the creeping variety of phlox. Like other types, Carolina phlox prefers evenly drained soil and cannot tolerate intense heat despite the need for full sun exposure. The pink flowers of this plant last a long time to provide consistent color in the perennial garden as well as beautiful cut flowers for indoor arrangements. This type of phlox grows wild in its native North Carolina.